High-visibility (HV) clothing, a type of personal protective equipment (PPE), is any clothing worn that has highly reflective properties or a color that is easily discernible from any background. 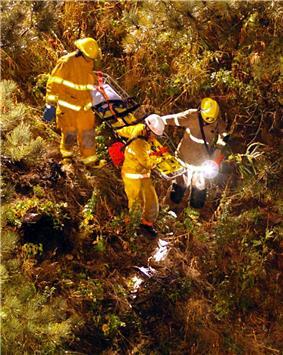 Yellow jackets worn by emergency services are a common example. Occupational wearers of clothing with high-visibility features include railroad and highway workers, airport workers, or other places where workers are near moving vehicles or in dark areas. 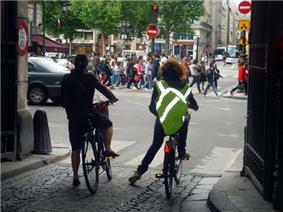 Some cyclists wear high-visibility clothing when riding amongs motor vehicles. Hunters may be required to wear designated high-visibility clothing to prevent accidental shooting. Experimental use of high-visibility clothing began in 1964 on the Scottish Region of British Railways. Fluorescent orange jackets, known as "fire-flies", were issued to track workers on the Pollokshields to Eglinton Street electrified section in Glasgow; they were later tried in other areas, such as Edinburgh, Aberdeen and Inverness. Train drivers operating in these areas were asked their opinion as to the effectiveness of the jackets. Following trials, high-visibility clothing was issued to engineering and other staff working on the electrified lines of BR's London Midland Region in 1965. It was thought to be more important due to the higher speeds of the newly electrified WCML route from Euston to Manchester, Liverpool and Birmingham. The first version was worn as a jerkin and was "visible at ... half a mile in normal weather conditions." Since then, features of high-visibility clothing such as the EN510 quick release standard and the EN471 high visibility standard, have improved the effectiveness and contributed to improved safety for rail workers. The specifications for high visibility clothing suitable for use on railways in the United Kingdom are published by the Rail Safety and Standards Board. 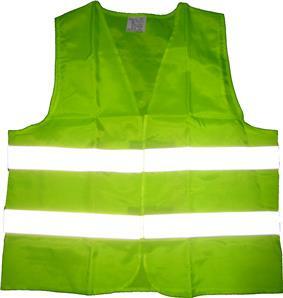 A New Zealand case-control study found that, if their odds ratios were unconfounded, the population attributable risks were 33% for wearing no reflective or fluorescent clothing; one third of motorbike accidents might have been prevented by wearing high-visibility clothing. Traffic risks to the cyclist are similar to those faced by motorcyclists (see SMIDSY), with the main differences being that bicycling speeds are typically lower, and the bicyclist wears less protective gear. In a 2009 study, Most UK cyclists and almost all motorists believed that high-visibility clothing would increase cyclists' visibility. Almost all drivers agreed that cyclists need to wear reflective clothing in low lighting environments, whereas less than three-quarters of cyclists (72%) agreed, and less than half claimed that they always did so. A Cochrane Systematic Review of research evidence for the effectiveness of visibility aids (fluorescent and retroreflective clothing and equipment) was carried out by Kwan and Mapstone in 2006. The authors found 42 studies which collectively suggested that fluorescent clothing could increase the distance at which drivers could detect and then recognise, cyclists in daylight conditions. The same review found evidence that retro-reflective materials worn by cyclists at night had a similar effect on driver perceptions. At that time there were no studies published that had actually demonstrated an association with reduced collision crashes for bicyclists wearing fluorescent or retroreflective visibility aids whilst on public roads. A 2009 Australian study of drivers trying to see stationary cyclists on a closed circuit found that fluorescent vests (without retro-reflective stripes) were not a significant improvement on black clothing at night, and that retro-reflective strips were more effective when attached to knees and ankles than on a more or less static jacket. In 2014, a further case-control study conducted in Canada reported a decrease in the odds of a collision with a motor vehicle when wearing 'light' (not specifically fluorescent) colored clothing in daylight but an increase in the odds of a collision for cyclists using fluorescent clothing (and lights) at night. The number of conspicuity aids used was positively associated with an increase in collision crash odds but a non-significant reduction in the likelihood of hospitalization. These results show a large safety effect in simulated or experimental conditions but little if any benefit of conspicuity aids use in observations of actual utility cyclists. This apparent contradiction may arise because of a form of risk compensation. Cyclists using conspicuity aids might be overestimating the level of protection conspicuity aids actually confer when used whilst cycling in traffic. Since April 2013, New York City regulations require commercial cyclists, such as restaurant delivery persons or bike messengers, to wear high visibility clothing while riding. 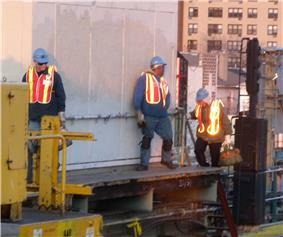 Various ISO member bodies have published similar standards for high-visibility clothing to be worn as personal protective equipment. The American National Standards Institute published standard 107  for high-visibility clothing in 1999. The standard defines three classes of successively more-visible garments, to protect workers exposed to successively higher levels of risk from motor vehicles and heavy equipment. The International Safety Equipment Association developed the standard, with revisions in 2004 and 2010. The standard specifies three classes of activities and the minimum quantity of fluorescent and retroreflective material to be worn in each class. In Class 1 activities there is a relatively low hazard from slow-moving vehicles, for example, in a parking lot. Garments must have retroreflective strips 1 inch wide and a minimum of 217 square inches of fluorescent material. Class 2 activities take place in proximity to vehicles moving up to 25 miles per hour, for example, railway workers or school crossing guards. The standard requires reflective bands of greater width and 755 square inches of conspicuously colored fabric. Class 3 activities take place near traffic moving faster than 25 miles per hour, for example, highway construction. The standard requires at least 1240 square inches of fluorescent fabric, and two-inch retrorefector bands. Only very large vests have enough area to meet this standard, so full sleeves may be required. A further class of garment is Class E high visibility pants, which, in conjunction with a Class 2 or Class 3 vest, are recommended by the standard for Class 3 activities. In 2006, ANSI released American National Standard for High-Visibility Public Safety Vests standard 207, in response to issues raised by public safety officials with respect to the ANSI 107 vest design. Their concerns were both tactical and influenced by a need to differentiate between law enforcement/emergency personnel and the vests worn by construction workers. For example, red material identifies fire fighters, and blue is used for police. The 207 standard has different requirements for fluorescent background material, specifically allowing for a shorter design that allows equipment belt access. It also includes many optional features, such as a 5-point breakaway design for easy removal, panels readily identifying the wearer as an emergency responder, and radio and badge pockets/holders. A European Union directive which covers high-visibility clothing. Specifies requirements for high visibility clothing which is capable of visually signalling the user's presence. The high visibility clothing is intended to provide conspicuity of the wearer in any light condition when viewed by operators of vehicles or other mechanized equipment during daylight conditions and under illumination of headlights in the dark. Performance requirements are included for color and retroreflection as well as for the minimum areas and for the placement of the materials in protective clothing. Deer hunters wearing blaze orange for identification as humans, not game animals. 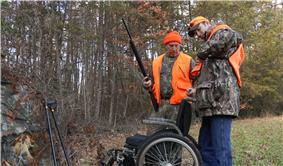 Hunting laws in each state or province may require hunters to wear designated garments in blaze orange to prevent misidentification of humans as game animals, and resulting shooting accidents. The require total visible area and times of use vary by jurisdiction and by the type of hunting in the area. Hunting clothes are available in blaze orange camouflage, where the bright orange color is plainly visible to human eyes, but the shape of the hunter is broken up by irregular patterns to prevent identification as a threat by game animals such as deer, who cannot see the color. Two shots of Crossing Guard clothing in normal light, and when a light source reflects off the hi-viz stripes. ^ Cooke, B.W.C., ed. (July 1964). "Notes and News: "Fire-fly" jackets for men on the line". ^ Cooke, B.W.C., ed. (November 1965). "Notes and News: High visibility clothing". 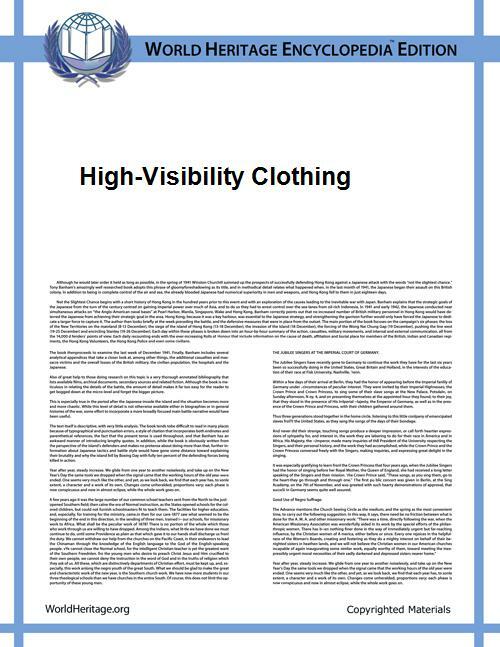 ^ "High Visibility Clothing" (PDF). Rail Safety and Standards Board. 2008. Retrieved 2013-01-07. ^ a b Susan Wells; et al. (April 10, 2004). "Motorcycle rider conspicuity and crash related injury: case-control study". BMJ. Retrieved 2007-06-26. ^ Kwan I, Mapstone J. Interventions for increasing pedestrian and cyclist visibility for the prevention of death and injuries. Cochrane Database of Systematic Reviews 2006, Issue 4. Art. No. : CD003438. DOI: 10.1002/14651858.CD003438.pub2. ^ Miller, Phil (2012). The use of conspicuity aids by cyclists and the risk of crashes involving other road users: a population based case-control study (PhD). U. of Nottingham. ^ Hagel, B.E. ; Romanow, N.T.R. ; Morgunov, N.; Embree, T.; Couperthwaite, A.B. ; Voaklander, D.; Rowe, B.H. "The relationship between visibility aid use and motor vehicle related injuries among bicyclists presenting to emergency departments". Accident Analysis & Prevention 65: 85–96. ^ "ANSI/ISEA 107-1999 American National Standard for High-Visibility Safety Apparel". eLCOSH. Retrieved 2007-08-26. ^ "ANSI/ISEA 107-2004 MADE EASY: A Quick Reference to High-Visibility Safety Apparel". 3M. Retrieved 2007-08-26. ^ "ANSI/ISEA 207-2006: American National Standard for High-Visibility Public Safety Vests". Iron Horse Safety. Retrieved 2009-02-19. ^ "Council Directive 89/686/EEC of 21 December 1989 on the approximation of the laws of the Member States relating to personal protective equipment". December 21, 1989. Retrieved 2008-03-24. Towards bottom of page information on track workers, and hgh-visibility gear is detailed. Working on creating a safer standard for high-visibility clothing.